Organ procurement teams are sometimes leery of accepting kidneys from deceased donors with acute kidney injury (AKI), fearing they will harm the recipients. However, a national study chaired by a Johns Hopkins kidney specialist suggests these fears may be unfounded. In medical chart reviews of 2,430 kidneys transplanted from 1,298 donors—585 (24 percent) of them with AKI—researchers say they found no significant differences in rates of organ rejection among kidneys from deceased donors with or without AKI. They also report they found no evidence that factors such as the amount of time an organ is chilled and left without blood supply before transplantation had any impact on recipient outcomes for those who received AKI kidneys. Results of the study, published Nov. 20 in the journal Kidney International, suggest that patients in need of kidney transplant could have access to more kidneys—potentially shortening organ waiting list times, the investigators say. With the field of medicine moving toward a system that focuses on the improvement of patient safety while reducing health care costs, this research is a step forward in the high-value health care movement. "Our results should add to evidence and reassure the general public and the transplant community that acutely injured deceased-donor kidneys appear to have the same success rates as noninjured kidneys from otherwise similar donors," says Chirag R. Parikh, M.B.B.S., Ph.D., director of the Division of Nephrology at the Johns Hopkins University School of Medicine and senior study author. "Even transplanted kidneys with the highest severity of AKI did not have worse outcomes, so we should bring these kidneys into the donor pool with confidence," Parikh adds. An estimated 95,000 Americans are on the national kidney transplant waiting list, according to the U.S. Organ Procurement and Transplantation Networks. Given the organ shortage, says Parikh, the transplant community should pursue measures to increase use of kidneys from deceased donors with AKI. AKI affects about one-third of patients in intensive care units, Parikh says. Hospitalized patients are likely to develop AKI as a complication resulting from reduced blood supply, or administration of medications to increase blood pressure, or from being placed on ventilators. Deceased donors are likely to develop AKI if they spent time in an ICU following a trauma or other medical or surgical complications. Physicians worry about patients who develop AKI because they are more likely to have negative long-term consequences, such as chronic kidney disease or premature death, Parikh says. It remains unclear if transplanting a kidney from a donor with AKI would have similar consequences. Nationwide, the discard or rejection rate for all potential donor kidneys is approximately 18 percent, and for AKI kidneys about 30 percent, Parikh says. 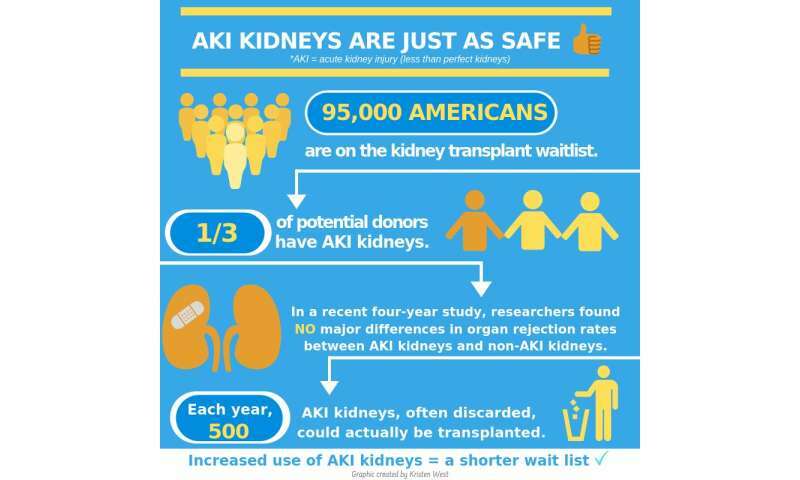 "We estimate there may be approximately 500 kidneys a year with AKI that are currently discarded, but can be transplanted." Some criteria that surgeons use around decisions for kidney discard include the presence of diabetes, hypertension or poor kidney donor profile index—a standard measure of how likely a kidney is to function over time. The current study had two parts. In the first section, researchers conducted transplant chart reviews for kidneys from 1,298 donors in five regional organ procurement organizations (Philadelphia, Michigan, New York, New Jersey and New England) from 2010-2013, and linked them to 2,430 single kidney transplant recipients via the Organ Procurement and Transplantation Network's national transplant registry. Donors with AKI, compared with donors without AKI, were more often African-American (24 percent versus 13 percent), more likely to have hypertension (36 percent versus 29 percent), and had a higher average kidney donor profile index (56 versus 46). Recipients of AKI kidneys versus non-AKI kidneys were more often older (55 versus 52 years old), and donor AKI kidney transplants had longer mean cold ischemia time (16.4 hours versus 14.9 hours)—the amount of time an organ is chilled before transplantation. The AKI kidneys also were more likely to undergo machine perfusion (a technique to push fluids through the organ to preserve it), a difference of 46 percent versus 37 percent, and slightly more likely to have human leukocyte antigen mismatches—a measure of how compatible a donor and recipient will be based on cell proteins. During an average follow-up period of four years, there were 623 (26 percent) kidneys that had permanent failure, so-called graft failures. This occurred in 475 (26 percent) recipients of AKI kidneys and 148 (25 percent) recipients of non-AKI kidneys. The severity of AKI did not impact graft failure rates. In the second part of the study, investigators examined recipient charts from a subgroup of 739 kidneys from 601 donors transplanted at 12 medical centers. They found graft failures or progression to kidney disease in 143 (19 percent) of the recipients (40 recipients received AKI kidneys and 103 received non-AKI kidneys). Kidney transplant potentially saves the health care system more than $250,000 per year for each patient in costs related to dialysis treatments, medications and hospitalizations, says Parikh: "Hopefully this study will provide confidence to surgeons that they can transplant these kidneys and expect good outcomes." The researchers caution it is possible that donor AKI kidneys selected for transplant have a more favorable risk factor distribution than the donor kidneys without AKI. In addition, donor AKI kidneys may be less likely to be selected for transplant unless they have other, more favorable characteristics such as younger age and an absence of other chronic health conditions. Does the US discard too many transplantable kidneys?